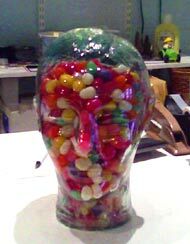 I was at the Landmark shop in Andersonville yesterday, and the nice lady behind the counter asked me to guess how many jellybeans were inside the glass human head and write my answer on a slip of paper. I guessed 425. No wait, 450! 17,034! A zillion! Oh my heavens, the pressure. I seem to remember reading that the human brain has roughly 100 billion neurons. Do you think that might be the answer? Jellybeans = neurons. A fiendishly clever riddle on the part of the Landmark shop, if true. Well, I’ve never been much of a bean counter, but it’s always nice to be asked your opinion about something. Now, let’s talk Chicago theater and performance, shall we? • The following hot little bit of breaking news is an Ocelopotamus WORLD EXCLUSIVE, people. Just the first of many, we hope. We here at Ocelopotamus are tickled a hot shade of magenta to announce that The Partly Dave Show will be ending its recent hiatus on Wednesday night, May 2nd, with a very special edition of the show at The Neo-Futurarium. The line-up and other details are still being worked out, but I can tell you that my co-host Christopher Piatt will be on board that night, as well as our newly anointed co-co-host, Diana Slickman. And with a little luck, Even in Blackouts are going to be playing live. But that’s all you get till next week. Or so. In the meantime, save that date! • This weekend is your last chance to see The Strangerer â€” it closes Sunday, and according to Theater Oobleck’s Web site, Saturday night’s show is sold out. You can still catch it Friday or Sunday, but be sure to make reservations. I saw last Saturday’s sold-out show and I have to say that Mickle Maher’s performance as John Kerry is downright eerie, both vocally and physically â€” I hadn’t really thought Kerry had so many mannerisms to play off of, but Mickle proved me very wrong about that. Ditto for Colm O’Reilly as Jim Lehrer, supplying an understatedness that was brilliantly over the top. Guy Massey is very good as GWB as well, but I’ve seen a lot more GWB impressions so the bar is set a little higher there. Nonetheless, all three of them turn in finely crafted performances, and the show is as good as you’ve heard. I don’t know if this is the author’s intention or not â€” I would never try to fathom the unfathomable mind of Mickle Maher â€” but for me, the show effectively captures the profoundly disturbing feeling of watching a president literally get away with murder, while the media and many Democrats â€” as well as the entire Republican party, of course â€” maintain an anesthetized business-as-usual attitude that becomes pointedly surreal when juxtaposed against what’s taking place on the stage. You know, just like the last six years. • The Neo-Futurists are gearing up for their next prime time show, Sean Benjamin’s Poker Night at the White House, which opens April 19. And apparently it involves a life-size old man puppet. • Chicago poet Yvonne Zipter has a new book of poems about her greyhounds, called Like Some Bookie God. I’ve long thought of Yvonne as one of the very best poets in Chicago, mainly because of her beautifully wrought 1990 collection The Patience of Metal. (And though she’s a friend, I thought that for years before I ever met her.) I found out about her reading at Women & Children First Books this past Wednesday too late to attend, but I’m looking forward to reading the new book. • Jane Goodall will be giving a lecture entitled “Inside the Mind of the Chimpanzee” in the Navy Pier Grand Ballroom this Sunday the 25th, from 2-5pm. And it’s sold out. Jane Goodall is one of my personal heroes, so even though I can’t attend this, I feel good just knowing she’ll be in town.